In late September, we outlined how Bank of Ameria called it: "The Peak In-Home Sales Has Been Reached; Housing No Longer A Tailwind." Then in October, we noticed how existing home sales data retreated in September, dropping to the lowest level in nearly three years. All the while, an affordability crisis remains widespread in most cities across the US, but could not have come at the worst time, regarding the Federal Reserve's monetary tightening program that is forcing mortgage rates to cycle highs. So, you must be asking: What does this all mean? Well, the American real estate market could be at a significant turning point. Analysts from GOBankingRates have published a new report this week showing home prices across the country are plummeting. Geographically, there are some loose patterns in California and Texas, but a bulk of the distress is originating from Midwest and Southeast states. 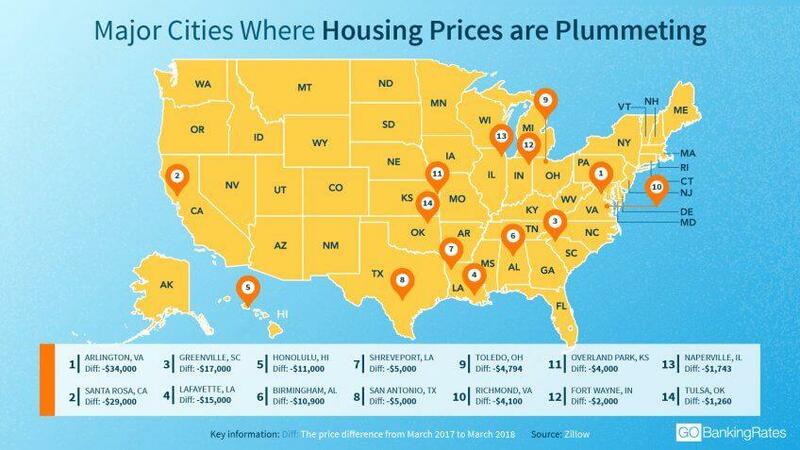 "Most of the cities with the biggest home price drops are located in the South, with the Midwest being the second-best area to find cities where home prices are plummeting. The two geographical outliers are Santa Rosa, Calif., and Honolulu," said GOBankingRates. Falling home prices are good news for first-time millennial homebuyers across the country, but with interest rates soaring and most young people stuck in the gig-economy with low wages and high debt loads, well, the demand floor in prices could be much lower than today. Expect further declines into 2019.